8th - 16th April 2019 One of the most spectacular sights in the world and the highlight of this painting and sketching holiday to Jordan is the ancient Nabataean city of Petra. Capture the changing hues in the sandstone as the sun moves across Petra, sketch the spectacular landscapes from Mount Nebo, Crusader Castles along the King's Highway, the Roman city of Jerash and the local Bedouin people. 26th April - 6th May 2019 Istanbul is a vibrant and intoxicating city to paint where East meets West and with a skyline like no other place on earth. Join renowned oil painter Peter Brown aka 'Pete the Street' and capture the defined lines of minarets and beautiful domes of the Blue Mosque, Aya Sofya and the Mosque of Sulyeman the Magnificent, the dawn mists lingering over the Bosphorus and lively street scenes in the Grand Bazaar. 2nd - 11th May 2019 Venice is one of the most painted cities in the world and on this tutorial painting holiday Hazel Soan will help intermediate and beginner students overcome any inhibitions and reservations and capture the glory of Venice. 12th - 20th May 2019 Iceland's landscapes, seascapes and skies are dramatic and on a scale that takes your breath away, and will challenge artists of all levels. Richard Pikesley is a very experienced artist and on this painting holiday he will help intermediate and experienced students capture the immensity, intensity and atmosphere of Iceland's natural phenomena. An oil, watercolour and mixed media painting holiday. 1st - 10th June 2019 Symi is one of the most quintessential sun-drenched island in Greece. It can only be reached by boat and has very few hotels so greatly appeals to artists and writers. This semi free-style oil painting holiday is ideal for intermediate and experience students. There will be a mixture of tuition and demonstrations in between lots of painting time. 1st - 12th September 2019 A fantastic opportunity to go on safari to one of the best wildlife places on earth with a leading professional wildlife artist and return with a full portfolio of the action. This tutorial watercolour painting safari is ideal for intermediate students. This is a rare chance to work alongside some of the best contemporary figurative artists – Peter Brown and Patrick Cullen, in fabulous locations in Europe and further afield. Guest artists will provide some personal guidance and talks on how they like to work – these are work-alongside painting holidays with a supportive group atmosphere and foremost leadership. Richard Pikesley, Lachlan Goudie and Haidee-Jo Summers will provide some individual guidance and demonstrations when appropriate. These free-style painting holidays will have a loosely structured format based on an organic approach. The aim is to encourage everyone to produce paintings they are happy with. Hazel Soan is a dedicated and enthusiastic tutor who gives everything to the students that travel with her. There will be tutorial sessions, group demonstrations and a structured format to help students learn techniques and overcome challenges of en plein air painting. 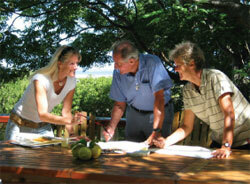 Hazel’s love of Africa and wildlife is well known and she is one of the best tutors to go on a painting safari with. For those who prefer more familiar painting subjects Hazel also does a European painting holiday.